February | 2010 | EthNoise! 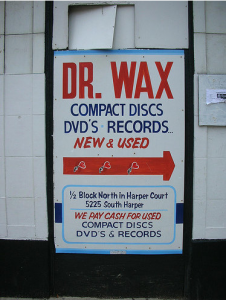 Please see the link to Andrew Mall’s recent post on the sad news of the closing of Dr. Wax in Hyde Park. Abstract: When westerns express nostalgia for the frontier, they embody a modern form of cultural memory, based in mass media. These films depict historical realities, yet they tend to be highly stylized: their stock images, characters, and plotlines all contribute to a mythology that engages nationalism, modernity, gender, and race. Music participates in these representations in various ways. Realist film westerns, for example, often use diegetic period music to enhance a sense of authenticity. But music may also highlight the medium’s artificiality, especially when song and dance take center stage. This presentation will explore movies that blend the western’s conventions and concerns with those of the Hollywood musical. From Song of the West (1930) to The Best Little Whorehouse in Texas (1982)—that is, from Oscar Hammerstein to Dolly Parton—this subgenre combines the western’s longing for an American past with the musical’s romantic vision. I consider how this blend leads to tensions—between masculine and feminine roles, the urban and the rural, or folk and Broadway styles—and how such tensions are expressed in particular films. Western musicals, I will argue, recall historical trauma in ritualized form, offering affective experiences of the Old West and constructing the country through song. Bio: Jonathan De Souza is a PhD student in Music History and Theory in the Department of Music at the University of Chicago. He received his MMus in Theory and Analysis at Royal Holloway, University of London. His interests include: Perception and conceptualization of musical texture; film musicals and cultural memory; indeterminate music, analysis, and discourse (Cage, Boulez, Feldman). Abstract: Astillero is a contemporary tango ensemble based in Buenos Aires, Argentina, whose work is focused on rearticulating tango’s relationship to a specifically Latin American notion of “the popular.” This project is framed by the contested musical and social histories of tango as a popular genre in Argentina, as well as the larger challenges posed by the 2001 Argentine economic crisis and its aftermath. Within this context, I will discuss how Astillero’s project of remaking tango a música popular must be understood as both a musical style and a social movement, an aesthetic ideology and an embodied social practice. This—like “the popular” as such—can help us question the managerial impulse to productivity that is increasingly determining cultural life in Buenos Aires and beyond, while also helping us to better understand the changing role of music and the arts within the global context of crisis. Bio: Morgan Luker received the PhD in ethnomusicology from Columbia University, and is currently serving as Visiting Assistant Professor of Music at Carleton College. His studies focus on music and cultural policy in Buenos Aires, Argentina, with a special interest in the cultural politics of contemporary tango. Abstract: Luis’ paper focuses on fieldwork done in the “techno” / “minimal” dance music scenes in Paris, Berlin, and Chicago, where partygoers often describe an ideal “night out” in dualistic terms, articulating a desire both for smooth, effortless social interaction and intense, jarring rupture. This smooth/rough dialectic produces a sort of “Coming Undone Lite©,” which sustains the hope that one can come together differently at the end of the night. The paper engages with and diverges from the extant literature on intense experience, including concepts of /jouissance/, limit-experience, and even everyday, ordinary affect. Bio: Luis-Manuel Garcia (PhD candidate in Ethnomusicology, Department of Music) has conducted focused fieldwork in the “minimal techno” scenes of Chicago, Paris, and Berlin. His dissertation project focuses on intimacy in crowds: the emergence of a sense of intimacy between strangers/acquaintances on the dancefloors of Electronic Dance Music (i.e., “techno,” “house,” etc.) events, as well as the role of music and affect in sustaining this feeling. Please join us for Ethnoise! The Ethnomusicology Workshop, taking place this Thursday afternoon, February 11, from 4:30 to 6 in Goodspeed 205. We welcome Professor Charles Garrett, Associate Professor of Musicology at the University of Michigan School of Music, Theater & Dance, presenting: “Joking Matters: Humor and American Music”. Charles Hiroshi Garrett is Associate Professor of Musicology at the University of Michigan School of Music, Theatre & Dance. His graduate work at the University of California, Los Angeles was supported by an AMS Howard Mayer Brown Fellowship as well as an AMS-50 Fellowship, and his dissertation received the Wiley Housewright Award from the Society for American Music. His book _Struggling to Define a Nation: American Music and the Twentieth Century_, published by University of California Press in 2008, was awarded the Irving Lowens Memorial Book Award by the Society for American Music. He now serves as editor-in-chief for _The Grove Dictionary of American Music, second edition_. This presentation discusses a book-in-progress that examines how various forms of humor–including slapstick, wit, satire, parody, and irony–have occupied and shaped American musical culture. Incorporating research on humor from across the humanities and sciences, my work seeks to address the play and pleasure of musical humor as well as its power, depth, and gravity. My work seeks to integrate considerations about humor into research about an array of musical genres, and to insert music into ongoing scholarly conversations about humor.